In every trip we’ve made to Las Vegas over the last ten years, we always end up satisfying our cravings for authentic Asian cuisine while we lived in Marbella, Bali and now Puerto Rico. This trip was no different and we ate several times at the brightly-lit Wendy’s Noodle Cafe. 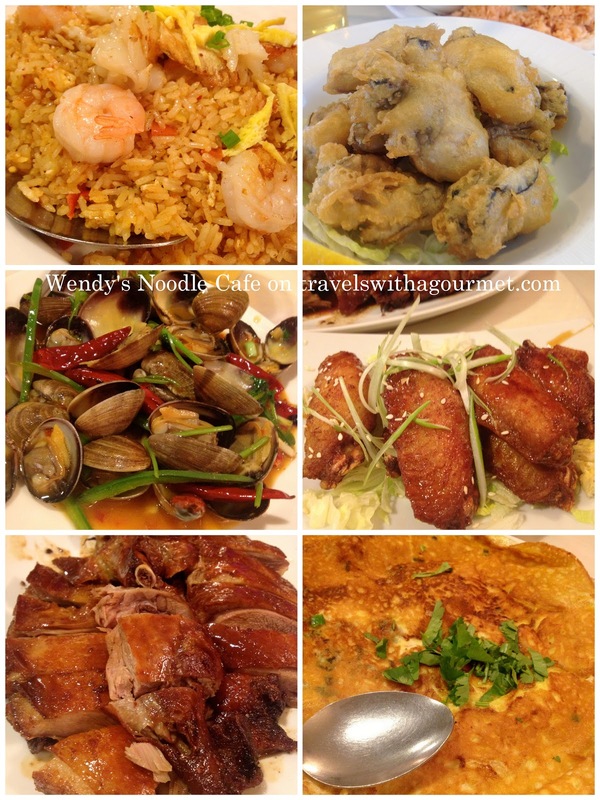 With it’s not-too-Chinese interiors and modern take on classic Chinese dishes, Wendy’s is often packed and since it’s open all-day everyday, one can walk in at noon on a weekday and get a fresh-cooked Chinese meal quickly. For dinner, we had some of the Asian tapas ($4.95) – salt and pepper shrimp and grilled chicken wings followed by clams in chili black bean sauce from the daily specials, half roast duck and oyster omelet from the chef’s specials, stir-fried needle noodles with shrimp from the extensive noodle menu and a spicy Tom Yum prawn fried rice. For an early lunch another day, we had the golden fried oysters and two rice plates – hammered chicken and beef short rib which both came with steamed rice, plus a stir-fried Chinese broccoli. Both times, the food was fresh, hot and flavorful and the prices are so reasonable that there’s no reason not to come back.